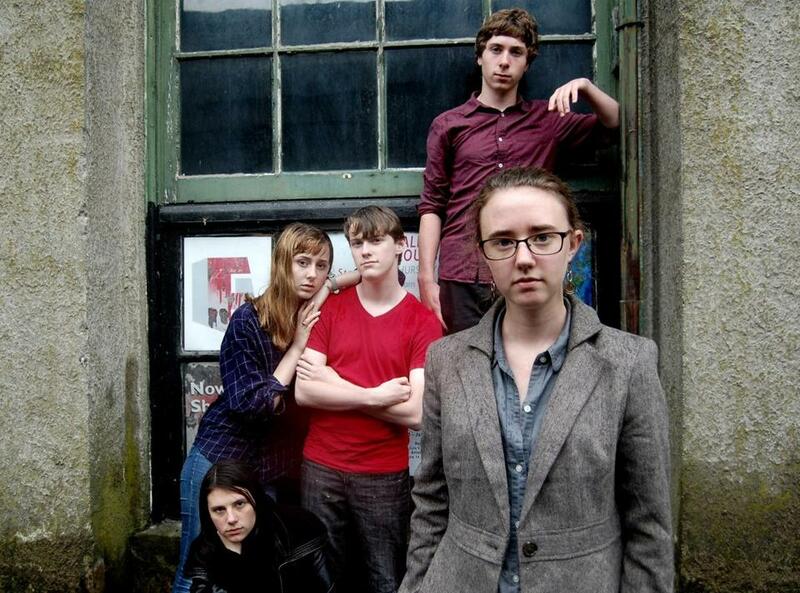 The cast of Kultar&apos;s Mime: Ali Weinstein (bottom, front), Evelyn Oliver, William Blanchette, Aidan Connelly (back), Leah Raczynski (front). Even though it happened a decade before she was born, Hopkinton resident Mehr Kaur has known the story of the 1984 siege on Sikhs in the Indian city of Delhi, following the assassination of Indira Gandhi, since she was a child. As a Sikh herself, not only is it a piece of the her family’s history, but her father, Sarbpreet Singh, wrote an acclaimed poem about the event called “Kultar’s Mime.” A writer, commentator and playwright, Singh was selected by The Boston Globe as one of the finalists in 2012 for “Bostonian of the Year,’’ in recognition of his interfaith work representing the Sikh community. So when Kaur’s nascent theater company, Two Paths Productions, was contemplating its first project, the idea came to her to adapt her father’s poem for the stage. After a year of work getting the fledgling theater company off the ground, Kaur and her three cofounders, all friends from Hopkinton High School, will see their work performed Friday evening at their alma mater. They trace the genesis of Two Paths Productions to a trip they all took to Scotland as members of Hopkinton High’s drama group. There, they attended the Edinburgh Festival Fringe, and witnessed a range of dramatic works not only performed but produced and managed by people barely older than themselves. “Because there aren’t that many opportunities to pursue theater here in Hopkinton, we decided that we wanted to start a student film and theater project that would run summers only, when we were home from college,” Kaur said. Although she has spent the past nine months as a freshman at Smith College, Kaur continued thinking about the theater company and writing a script based on her father’s poem. The group of founders set up a Facebook page and posted fliers around town; when Kaur was home in March, they held auditions. Eventually, five actors, all 17 or 18 years old, were chosen to play the parts. Writing the play was an interesting creative exercise, Kaur said. Even though the play is about children and their perspective on the days of violence that prevailed in Delhi during that siege, Kaur stresses that the violent imagery and the political context of the events portrayed make it probably inappropriate for a young audience. However, she strongly hopes teenagers and adults will see the single performance, both because she is proud of her new production company and because she considers it a story that needs to be understood more widely. Like Kaur, cofounder Leah Raczynski was raised to understand the recent history of her Sikh heritage, so she was aware of the events of 1984 but had not known the story in depth until she read the poem, she said. Kaur invited her to join forces and serve as assistant director, but after another actor had to drop out due to scheduling conflicts, Raczynski became a cast member as well. “I love to act, but I’d never done anything this serious before,” Raczynski said. The other responsibility Raczynski took on was that of teaching the rest of the cast members, none of whom came from a Sikh background, to understand the story’s historical and cultural context. The next project for Two Paths Productions is a film they hope to produce this summer, having just finished the script. Raczynski, who will attend Boston University in the fall, is composing the score. Tickets to the 7 p.m. show Friday at Hopkinton High School are free, and may be reserved at www.kultarsmime.eventbrite.com. For more information, contact twopathsproductions@gmail.com. ENCORE REVUE: The Hudson-based River’s Edge Arts Alliance celebrates the 25th anniversary of its Summer Drama Workshop with “A Blast from the Past” at 7 p.m. Saturday at Hudson High School, 69 Brigham St.
Tickets are $10 and can be ordered at www.upwitharts.org. FABRIC OF ART: The Fruitlands Museum will host an opening reception for “The Nobility of Things,” an exhibition of new mixed-media pieces by artist-in-residence Jodi Colella, from 1 to 3 p.m. Saturday at 102 Prospect Hill Road in Harvard. Colella weaves together both found and manufactured materials to investigate their inherent qualities, and to celebrate the intersection of science and art, according to the museum’s announcement on the show, which runs through Nov. 3. For more information, call 978-456-3924 or go to www.fruitlands.org. WORLD VIEWS: “No Limit,” a show juried by Kathryn Markel, is on exhibit at Fountain Street Fine Art in Framingham through Aug. 3, with an artists’ reception set for Saturday from 5 to 7 p.m. The display features 45 pieces from 36 artists nationwide chosen for their distinctive perspectives on the world. For show hours and more information about the artist-run gallery at 59 Fountain St., call 508-879-4200 or go to www.fountainstreetfineart.com. Nancy Shohet West can be reached at nancyswest@ gmail.com.